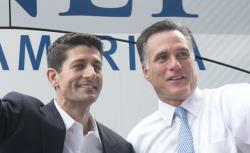 'Air Force One' theme song scores Romney's VP party for Paul Ryan. The music to Air Force One was written by Jerry Goldsmith, a prolific American composer who also wrote scores for Star Trek: The Motion Picture, Hoosiers, and L.A. Confidential. In the 1950s, Goldsmith, who died in 2004, launched his career in television, providing music for an array of programs at CBS. It’s not the first time, of course, that a presidential campaign has used movie music as a backdrop for an important speech. On election night in 2008, Barack Obama and his running mate Joe Biden waved to supporters amidst the soaring soundtracks to Remember the Titans and The Patriot.